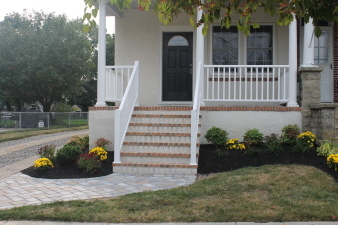 Completely Renovated 3 Bedroom, 2.5 Bath Twin! What more could you ask for?!! A Historic and charming town coupled with a property that faces the Merchantville Community Center & park which has been fully reconstructed from the walls and floors in! Spacious and Bright, New everything, Low Taxes! From plumbing, to electric, to roof, to walls, baths, kitchen, doors, windows, and exterior stucco - Its all NEW! Enjoy views of the ball field, playground, and tennis court while relaxing on the front porch. Nice sized Living Room w/coat closet showcasing beautiful flooring throughout the 1st floor, Dining Room w/breakfast bar into the Kitchen which is nicely appointed with lots of cabinet and counter space along with appliances included. Rear Family room w/sliders to the back yard and a main floor half bath & Laundry room! The enlarged 2nd floor offers huge closets, new carpeting, and a Master Bedroom with loads of space! Recessed lighting throughout, Gas heat, Central Air, and Full Basement for plenty of storage. Don't Miss this One!